It's an unsolved mystery that goes back almost 30 years: What happened to Connie Royce? The 24-year-old had gone out on a date to the Hayloft in Mt. Clemens on June 1st, 1990 but left alone and disappeared. Det. Lt. Melissa Stevens with the Macomb County Sheriff's Office has been working on Connie Royce's cold case for the last ten years. 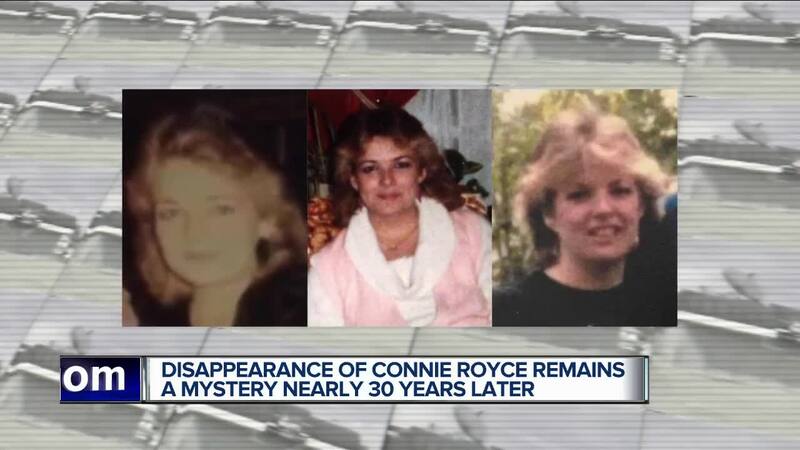 (WXYZ) — It's an unsolved mystery that goes back almost 30 years: What happened to Connie Royce? The 24-year-old had gone out on a date to the Hayloft in Mt. Clemens on June 1st, 1990 but left alone and disappeared. Det. Lt. Melissa Stevens with the Macomb County Sheriff's Office has been working on Connie Royce's cold case for the last ten years. "When I think of the name Connie Royce, I think where did she go and why can't we find her?" says Lt. Stevens. Connie is seen on surveillance video walking in with her date and his friend. Investigators say she seemed happy and affectionate, but 50 minutes later, that same video shows her leaving alone. "She decided she had to go and get out of there, no shoes on feet. Connie walks out of the bar and appears intoxicated to me and she's gone. No one's heard from her since," says Lt. Stevens. Over the years, Lt. Stevens says police had looked into several leads, conducted witness interviews and polygraph tests, but there were no suspects. The two men she was at the Hayloft with the night of her disappearance were cleared and described by police as "forthcoming". The night Connie went missing, there was one possible sighting of her at a payphone across the street from The Hayloft, but nothing definitive. Det. Lt. Stevens says she thinks about Connie every single day. She has now reopened the case again and is exploring potential new leads. At the same time, a local mom, Nina Innsted is using her voice to shine a light on Connie's unsolved case. Innsted has her own podcast called 'Already Gone'. The focus is on 'true crime'. She started the podcast 3 years ago and Connie's story is her 112th episode. "I enjoy telling stories and honestly I don't like it when people get away with things. it really bothers me. It gives me a little sense of feeling like I'm helping out in a case," she says. Before each podcast, she checks in with law enforcement to make sure she has their blessing. This week's episode tells Connie's story. "We're revisiting how Connie spent her evening, what police did in aftermath of disappearance, what leads came in," says Innsted. As for what happened to Connie? Innsted believes Connie came across someone who didn't have her best interest at heart. She says, "I believe someone knows what happened to her and if the right person came forward, we could find Connie and bring her back to her family. I cannot imagine what it must be like to lose a child and not know and not have an answer." She says, "I think she got into a car with somebody and something happened and whoever that person is - is maybe still alive." Even if Connie is no longer with us, Lt. Stevens says it's never too late for justice or to bring her home. "My hope is that I can find her remains, bring her family some sort of comfort that she was found." If you know anything that could help investigators close this case, please call the Macomb County Sheriffs Detective Bureau at 586-307-9358.